Does choosing Islamic fashion mean a woman must abandon hope of looking stylish? Not so, according to Monika Jufry, the Muslim fashion designer behind well-known labels Sessa and Monika Jufry. Rather, she says, a clever woman adjusts her style to match her character and lifestyle, and can look chic and trendy without letting the beauty of the body peek through the clothes. “Someone who usually looks sporty doesn’t need to force herself to become feminine just because she wears Islamic dress,” says Monika. 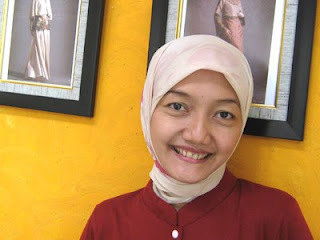 Monika, now 34 and mother of two children, became a designer “by accident”, taking it up in 1998 with the aim of making Islamic fashion more fashionable. I totally agree with her !!!! I like it . Im also starting a new blog so the girls that want to check it out and post a comment to give their opinion about it , you're welcome .